You thought I'd fallen off the face of the earth, didn't you? Well, I've been extremely busy and just haven't taken the time to blog. I've been low-carbing it for over 7 weeks now and have lost 20 pounds! I have also been running on Mondays, Wednesdays, and Fridays so I know that has helped me a bunch with the weight loss. 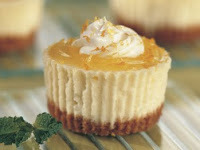 Following is a recipe for low-carb cheesecake cupcakes. The cupcakes don't look like the picture above, it was just the best looking picture I could find of a cheesecake cupcake! Bring cream cheese to room temperature. Place cream cheese in a bowl and add one egg at a time beating with a hand mixer. Slowly add the Stevia and vanilla. The batter will be thin. Pour into paper cupcake liners about an 1/8 inch from the top. Bake in a 300 degree oven for 30 minutes (or until large cracks appear on the top). Remove from oven and cool for 5 minutes. For the filling, add the Stevia and vanilla to the sour cream. Add a teaspoon on top of each cupcake and return to the oven for 5 minutes. Cool for 5 minutes and then refrigerate. Notes: These cupcakes can also be frozen. You may add lemon juice and lemon zest to the sour cream filling (though I only recommend this if you are making the regular cupcakes and NOT the chocolate ones - unless you like the taste of lemon with your chocolate!). Add 1 pkt Nestle Choco Bake Pre-Melted Unsweetened Chocolate Flavor and 3/4 Tblsp. Stevia to cream cheese mixture. Makes 18 cupcakes. Cupcakes are 1.92 carbs for vanilla and 2.36 carbs for chocolate. What I do is fill 9 cupcake liners with white, 9 cupcake liners with chocolate and then the remaining chocolate I put on top of the white and swirl them together. Paul and I love these cheesecake cupcakes so much that I make a new batch every weekend. It's wonderful to be able to eat something sweet and not feel the least bit guilty about it. I am glad you are showing some desserts made with stevia. I don't see that very often. Thank You.